Beyond the obvious benefits of taking pics of your knitting to post on your Ravelry projects page (which I know you are doing faithfully), taking pics of your knitting while in progress can help you have an objective view of how a pattern is working or whether the color combos you have chosen are really truly compatible. Even in the days before smart phones, we took pics of blanket layout ideas when knitting patchwork blankets. This is my The Geese, They Are A-Flyin Afghan. I took this pic after knitting a couple of the strips to see how they would look together. Here's my Log Cabin blanket (aka The Little Test Block that Grew), pre-sew up, with cat. As handsome as he is (and he IS handsome, isn't he? ), taking his pic wasn't the point. The point was: Will these squares look good next to those squares? Bonus: This photo will remind me of our layout decision after I pick it all up off the floor. Also, my cat is gorgeous. 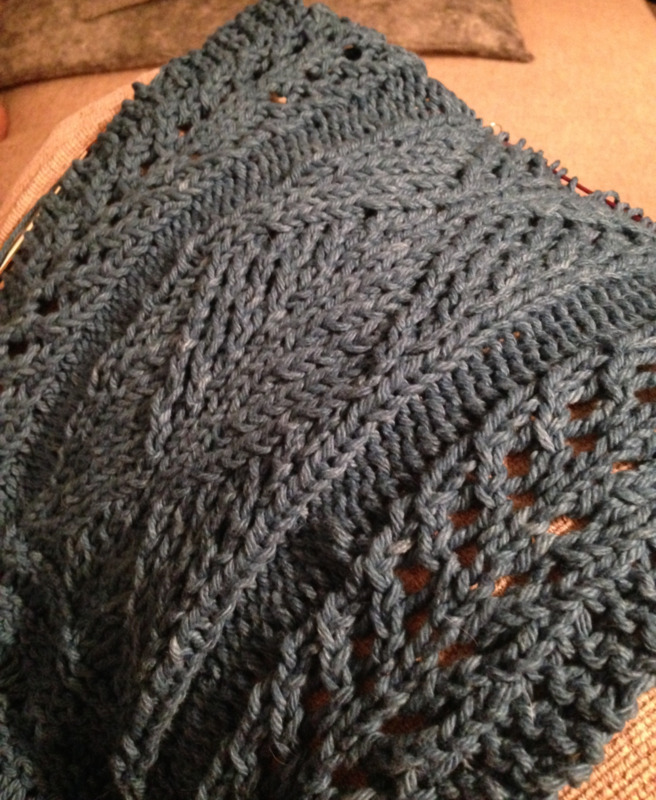 Here is my Charleston Indigo Scarf in mid-test knit. I needed to take a pic to see if it was really as pretty as I thought it was. So today's Simple Knitting Tip is to Use Your Smarts--smart phones, that is. Snap a quick photo of how it's knitting up and catch issues before it's too late to fix them. Snap a pic and never forget the colors you meant to put next to one another. Snap a pic and remember that the cat likes hand knits...but then you probably already knew that. So have you seen this? It's my new Framed Nine-Patch Baby Bib and the pattern is FREE in my Ravelry store! In honor of this new pattern, I am having a sale in my Ravelry store this weekend (10/3-10/5). You can save 20% off any pattern (except the FREE ones, cuz, well, that makes no sense to me) by using the coupon code "bib" at checkout. I think most of us who use it will agree: Ravelry is an amazing resource. I call it The Font of All Knowledge. If I have a question about knitting, blogging, iPhones, Dr. Who, local happenings, even world events, I can find someone in the Rav forums discussing it, or post a question to be answered by the amazing bunch we call Ravelers. Recently, I asked my daughter if she thought it would be useful to start a KnitOasis Ravelry group. Her response? "What? You don't already have one???" And so I started one. Why join another group on Ravelry? And more specifically, why join the KnitOasis group on Ravelry? Well, technically, you don't have to join ANY groups on Ravelry to get a lot out of it. As a database for patterns and projects and yarns and designers, it's probably the top website out there. There are others, but I have yet to find one that offers everything Ravelry has and is as easy to use as Ravelry. You can live your whole life without joining a group and you will most likely be happy enough. But, if you take the step of joining some groups (your local yarn shop's group or a group that discusses your favorite TV program or even one for knitters with cats) and participate in discussions in those groups, you will find a new level of involvement in your knitting (and crocheting, etc) life. Back in the old days, before Ravelry, when we wanted to find other knitters, we had to either bump into them in real life (True story: I was stopped by a woman one day as I walked into a grocery store because the bag I was using as my purse was something I had handknit and she could TELL that it was handknit and she and I had a lovely chat about knitting and patterns and yarn.) or find them via the webrings we joined our blogs to. (Remember webrings? Do they still have those??) When Ravelry came along, however, it was like, "There are knitters EVERYWHERE! My people! I have found my people!" The point is: Community. I can't tell you how many times I have been reassured of my sanity because it wasn't just me having a problem with a pattern/garden bug/movie plot/electronic gadget; there were others and sometimes there were helpful solutions and sometimes there was just company in our misery. On that note, I'll stop before my kids throw things at me (they hear my jokes a lot). I'll see you on Ravelry!